KUALA LUMPUR: Nadayu Properties Bhd aims to launch three projects worth a combined RM1.5 billion in the Klang Valley and Penang from next month to grow itself and build its branding. "We are upbeat on the market. We plan to have a good following and grow the company's net profit and revenue year-on-year. "We do intend to return dividends to shareholders. 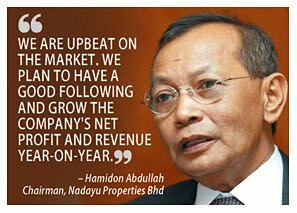 I believe overtime, we will have local and foreign funds investing in the company," Nadayu chairman Hamidon Abdullah said. Hamidon and Nadayu executive director Alex Cheang control 70 per cent of the company. Nadayu is launching a RM400 million project in Bandar Sunway called Nadayu28, featuring shoplots and high-rise residential units. Hamidon expects 10 units of five-storey shoplots to be sold prior to the launch based on the number of bookings it has currently. In Cyberjaya, Nadayu is launching a RM430 million mixed development by November and the first phase will comprise apartments and terraced houses. By end-2011, it will launch Nadayu290 in Bukit Gambir, Penang, featuring high-rise residences and commercial space. This is 50:50 joint-venture project with Affin Islamic Bank Bhd. "In the past, our projects were located in Cheras, Gombak and Selayang. We are now moving to where demand is," Hamidon said at the company's shareholders meeting here yesterday. On the 1.4ha land near Sheraton Imperial Hotel at Jalan Sultan Ismail that Nadayu had planned to buy from UDA Holdings Bhd for RM215.5 million, Hamidon said he is disappointed with the outcome. Nadayu had formalised the deal with UDA in July and planned to undertake a mixed development worth RM1.2 billion. UDA aborted the deal as it was unable to obtain the approval of its shareholders. Hamidon said Nadayu is seeking more landbank and may also undertake projects in Penang, involving land reclamation if the opportunity arises. "As a medium-sized developer, we can pick and choose what we want to do as we have the ability to buy tracts of land. We don't have to scramble for landbank. If we don't lose ourselves, we can progress credibly forward," he said.